As soon as the trailers for Jurassic World started to trickle out, one scene quickly rose to prominence above all the rest, asserting its authority over the pack with extended hands and a clear voice. You know the one—it’s the part where Chris Pratt’s character, trainer Owen Grady, faces down a pack of raptors with nothing but eye contact and calm machismo. 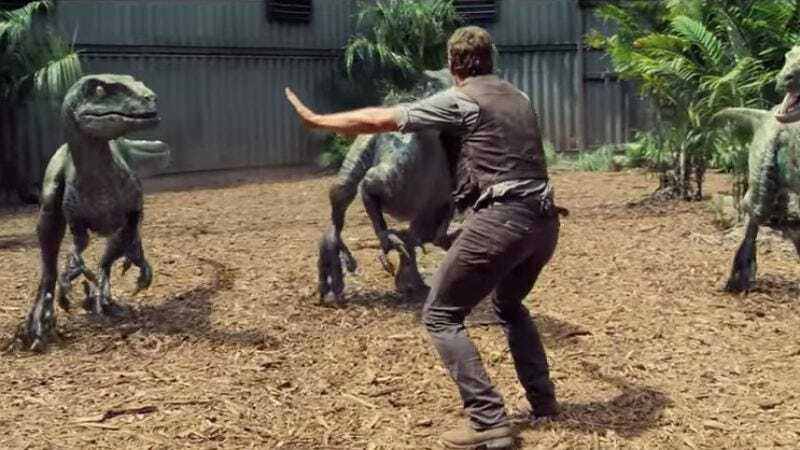 Unsurprisingly, the internet has had its usual field day with Pratt and his “Raptor Squad,” photoshopping all manner of nonsense into the scene. Buzzfeed has put together a gallery of all the best ones, featuring an array of adorable dogs, feathered dinos, and proferred bake goods. But the best shot in the compilation doesn’t look to have any digital manipulation at all. Apparently, Owen’s animal control abilities have made him the enviable hero of animal tamers and zookeepers everywhere, and thus we have this shot, taken from Tumblr user feminerds, showing a real-life zoo worker with his “Walrus Squad”—a pretty impressive scene, especially since a trio of walruses weighs a hell of a lot more than the floating ping-pong balls Pratt faced down in real life.